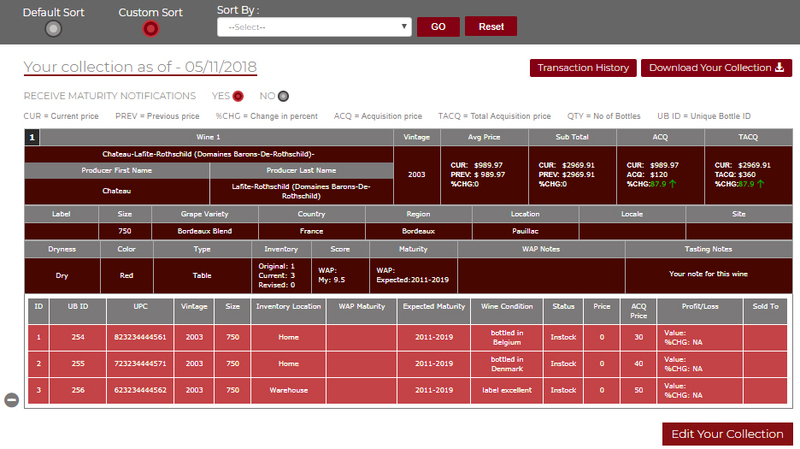 We have launched an exciting new wine collection management system on Wineauctionprices which will efficiently facilitate users being able to enter or upload, and manage their inventories. Pricing data will automatically be updated every time you login so that you are always aware of current values and can best determine purchase and investment strategies. Suggested maturity notes will be provided for major regions so that you can monitor drinkability, and you can choose to have automated reminder emails sent to you by the system for wines which have reached maturity and you may want to consider drinking or selling. For every wine listed in your inventory, in the Sell Price field you can enter a price that you would be interested to sell it for. If current auction sales reach that price or higher, the system will automatically notify you. Subscribe Now and gain access to all the features of Value My Collection. 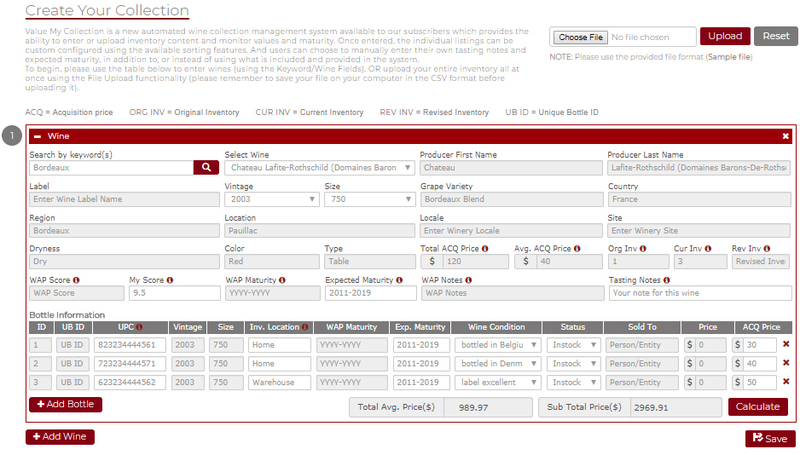 Value My Collection is a new automated wine collection management system available to our subscribers which provides the ability to enter or upload inventory content and monitor values and maturity. Once entered, the individual listings can be custom configured using the available sorting features. And users can choose to manually enter their own tasting notes and expected maturity, in addition to, or instead of using what is included and provided in the system. To begin, please use the table below to enter wines (using the Keyword/Wine Fields), OR upload your entire inventory all at once using the file upload functionality (please remember to save your file on your computer in the CSV format before uploading it).